Safe™ is the complete and super-concentrated dry conditioner for both fresh and salt water. Safe™ removes chlorine, chloramine and detoxifies ammonia, nitrite, and nitrate. It is non-acidic and will not impact pH. A further bonus for the reef hobbyist—Safe™ will not over-activate skimmers. Safe™ may be used during tank cycling to alleviate ammonia/nitrite toxicity. It contains a binder which renders ammonia, nitrite, and nitrate non-toxic, allowing the biofilter to more efficiently remove them. Use at start-up and whenever adding or replacing water. When transporting or quarantining fish, use Seachem StressGuard™. When adding new fish, use Stability®. Both are ideal for use with Safe™. Use 200 mg of Safe™ (included scoop) per each 200 L (50 US gallons) as needed to reduce chlorine and chloramine or per 50 L (13 US gallons) for ammonia. NOTE: These directions supersede all other prior packaging. Use 1.25 g (1/4 tsp.) for every 1,250 L (300 US gallons) as needed to reduce chlorine and chloramine or use 1.25 g (1/4 tsp.) for every 300 L (75 US gallons) for ammonia. For precise dosing, use the Seachem Digital Spoon Scale. May be added to aquarium directly, but better if added to new water first. If adding directly to aquarium, base dose on aquarium volume. For exceptionally high chloramine concentrations, a double dose may be used safely. To detoxify nitrite and nitrate in an emergency, up to 4 times normal dose may be used. If temperature is > 30 °C (86 °F) and chlorine or ammonia levels are low, use a half dose. The directions on the package I have are different than the ones on your website. Which ones are correct? A: The directions on your package are correct for the formulation in the bottle. We have simplified them for the web and the formulation in our newest packaging. How much Safe™ should I use to regenerate Purigen® in the 2nd step? A: If you are using Safe™ instead of Prime®, you should use about 16 grams of Safe™ per cup of water. 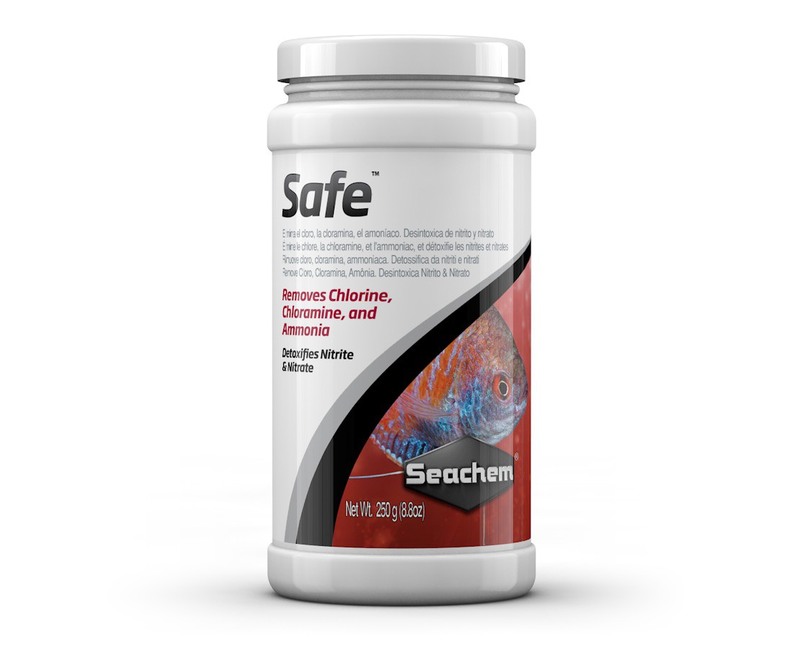 Can I mix Seachem Safe™ with water and store the solution to use later on? So instead of using the dry powder, I can use it pre-dissolved. A: Safe™ does not have the stabilizers, like Prime®, to keep it stable in liquid form. We do not recommend mixing it and storing it for future use.